Thank you for purchasing our theme. 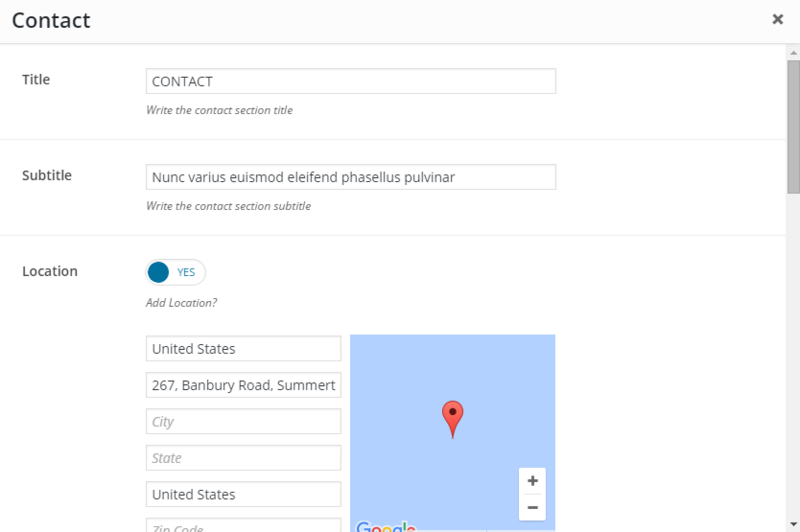 If you have any questions about the template, please feel free to contact us via support@flytemplates.com or the contact form. Thanks very much! 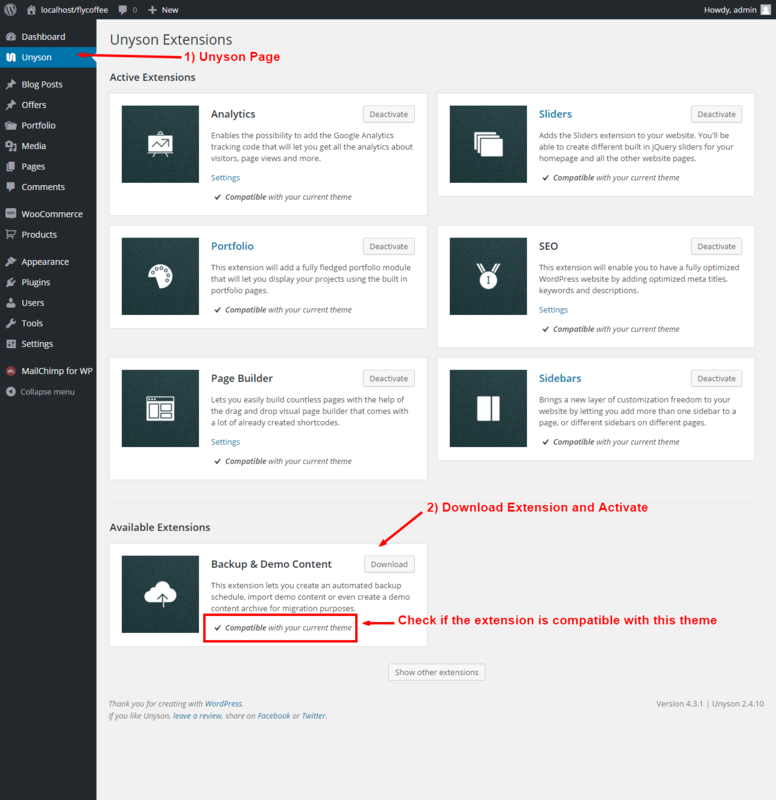 This documentation presents information how to install and use this theme. You can always find the latest version of this documentation online. Flypage can be used as a landing page or a simple blogging WordPress theme. Feel free to create your own website with this finished template. Containing more than 5 different layouts. Flypage WordPress theme can be used for landing page websites or for any other types of websites, just use your imagination and you can build with it alomest anything. 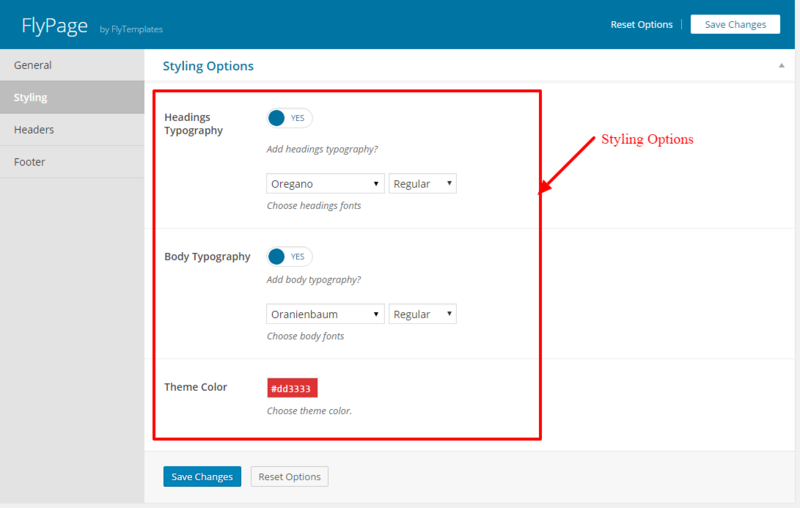 Use Theme Options and Shortcodes to customize your website. The user friendly WordPress interface will help and guide you through to build a fully working and clean website. Flypage has a clean and minimalistic design which helps you to create an awesome and powerful project. The whole template was built based on the latest standards and recommendations. Flypage theme is powered by Unyson (WordPress framework) and Twitter Bootstrap v3 (the most popular front-end framework). It means that it will be easier for you to do the changes and to increase its possibilities, thanks to many plugins it possesses. If you're planning to build a website using WordPress with flypage theme, you must first ensure your hosting provider meets WP's and our theme requirements. 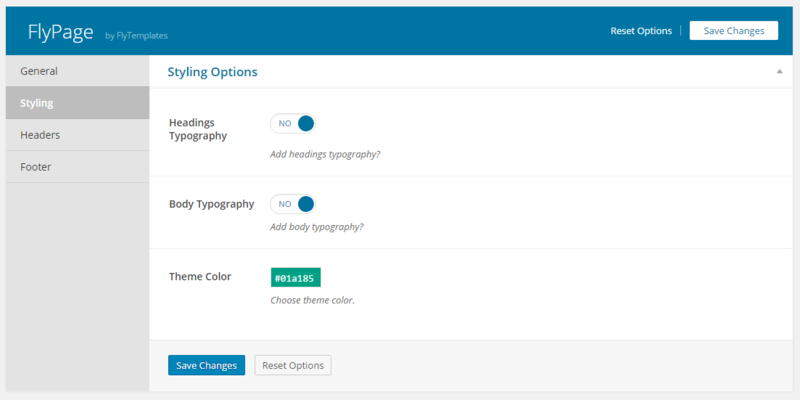 Please make sure that you are using the latest version of WordPress before you install flypage theme. You can find the information on how to install WordPress in WordPress Support (Codex). 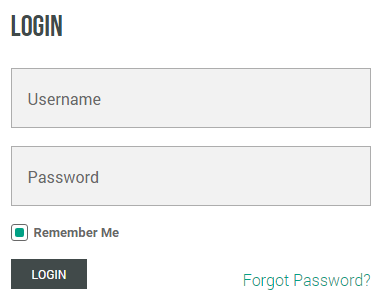 Login to your WordPress admin account (http://yourdomain.com/wp-admin). 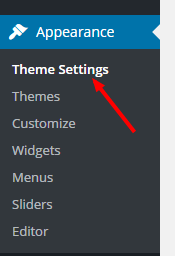 Click Appearance›Themes and go to Add New. Click Upload Theme, browse your files and find flypage-child.zip and flypage-parent.zip (make sure you are not uploading the whole .zip file that you've downloaded from Themeforest). 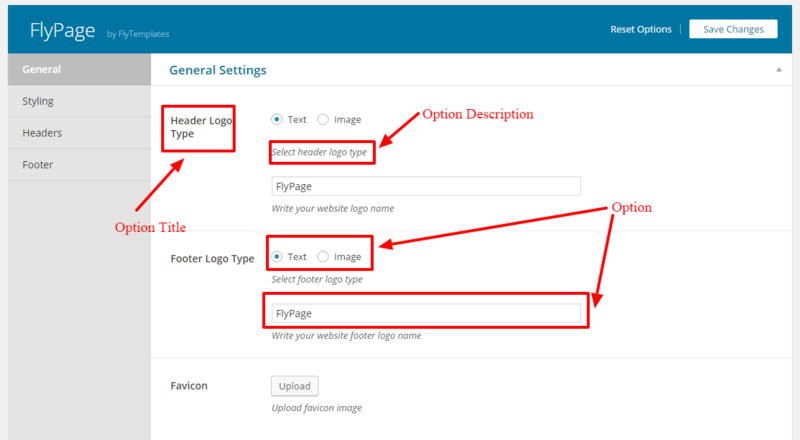 After Flypage theme is uploaded, click Activate flypage-child. Unpack the theme .zip file (flypage.zip) you have downloaded. Upload the /flypage-child and /flypage-parent folder (not: "flypage Files") to the /wp-content/themes/ directory in your WordPress installation on your server. Look for the flypage-child theme and click Activate. After theme activation you must follow next steps. 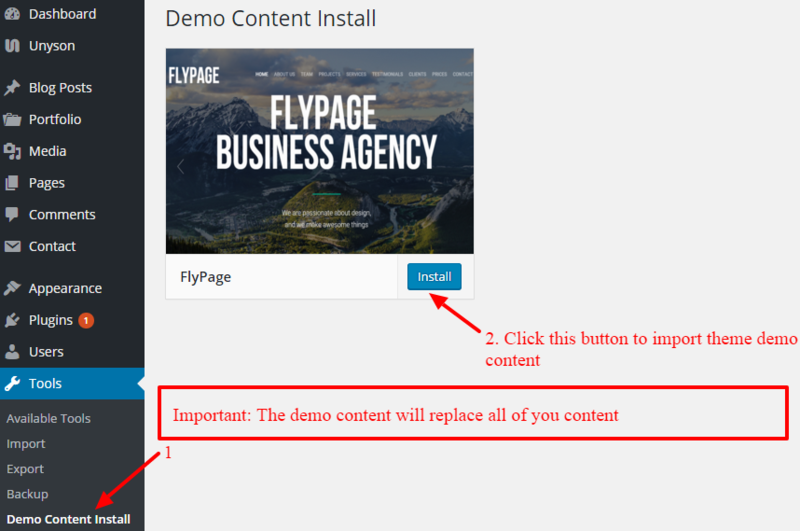 It is possible to import Flypage demo content to your WordPress website based on Flypage WP Theme. 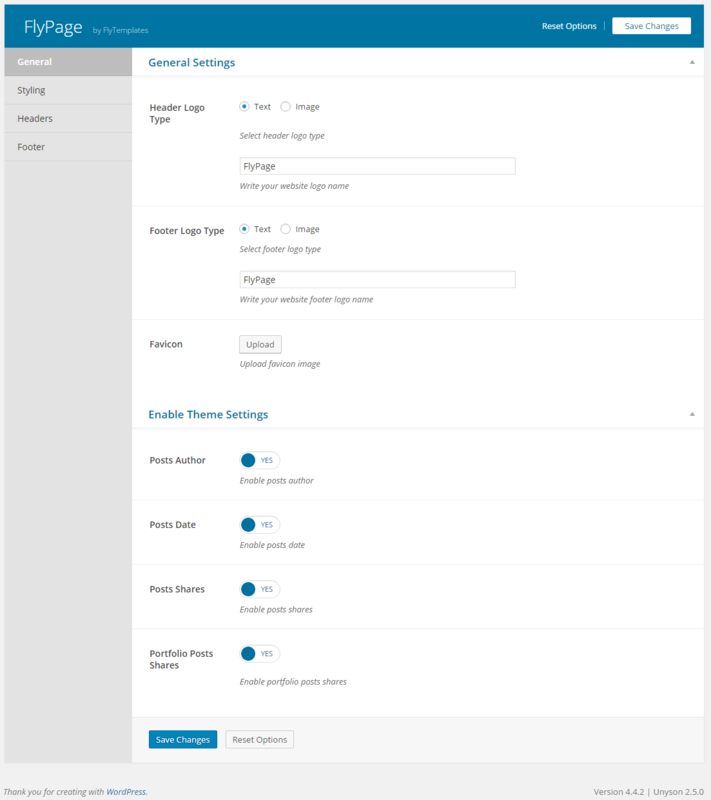 After the theme is installed, a new menu page called Appearance›Theme Settings will appear on the bottom left of your WordPress administration area. Main menu (Top Menu) is located in in the header area at the top of website. 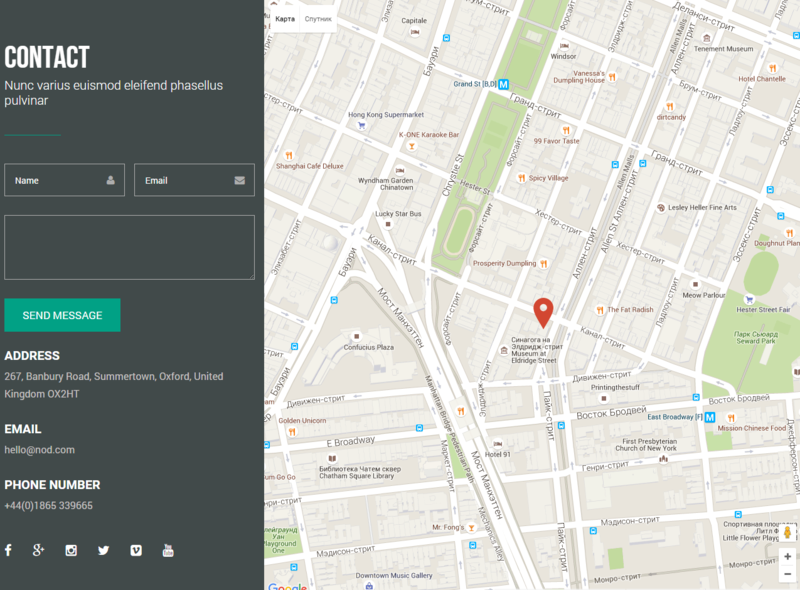 It is a group of navigation links for your visitors to find the important parts of your site faster. Menu is responsive and in mobile devices becomes right slide menu. If you did not set "navigation menu" after theme activation you can set it in Appearance›Menus. Here you can also make a new menu or edit an existing item. If you want to create new Primary Menu, you have to click "create a new menu" in top bar. After that you have to write new "menu name" and click Create Menu. After that you can add Pages, Categories and/or Posts to Menu structure, and you have to check "Primary Navigation" and click Save menu. Now Top Menu is ready and you can see it on front side. 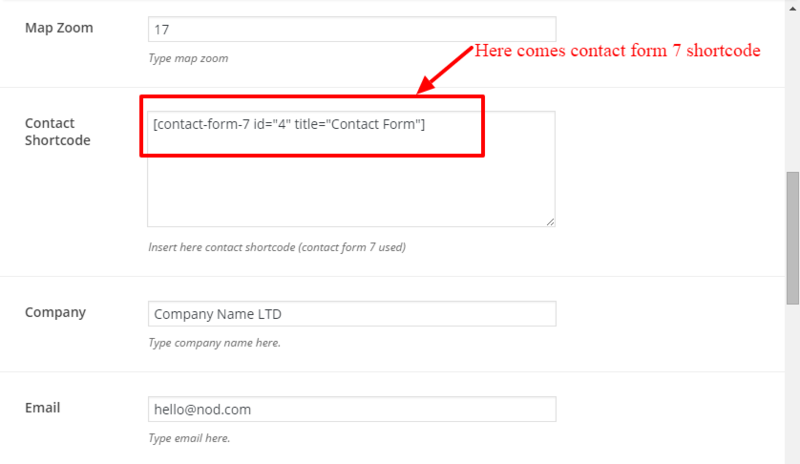 If you want to create an item in menu that is not a link you can add "Links" with URL "#" and your custom name. You can add this Link to the menu and make it a parent for some regular Pages. Thanks to this your link will be in the main menu and after clicking it, the user can see "sub-pages" of it. Parent Page can be also regular Page, but then "sub-pages" in menu will be visible after cursor hover. 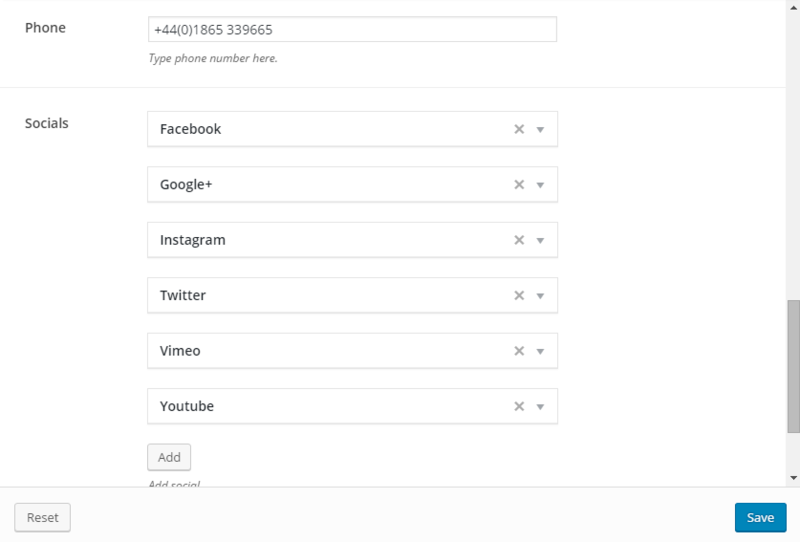 To sum up, if you want to create drop-down menu after clicking event you need to use parent as Link with "#" URL and if you want to create drop-down menu after hovering event you have to make menu only out of regular elements (Pages, Posts, Projects etc.). 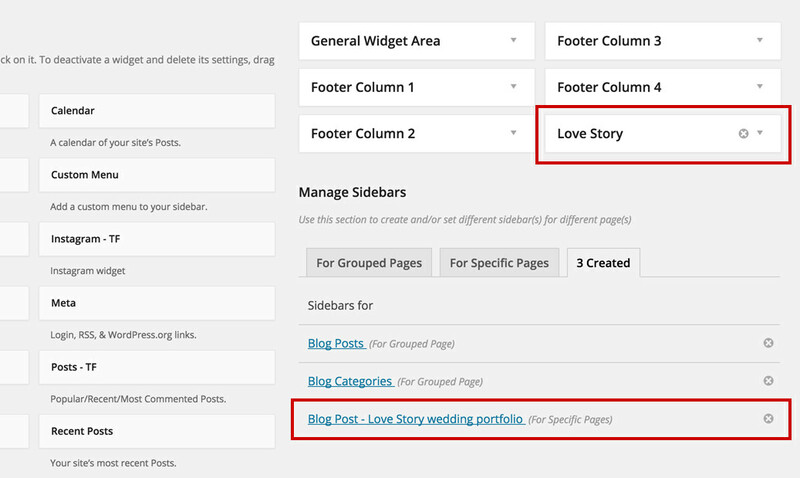 In WordPress, you can write Posts or Pages. Pages are static. They are a good way to publish information that does not change much, like an "About us" page. Pages live outside of the normal blog chronology. 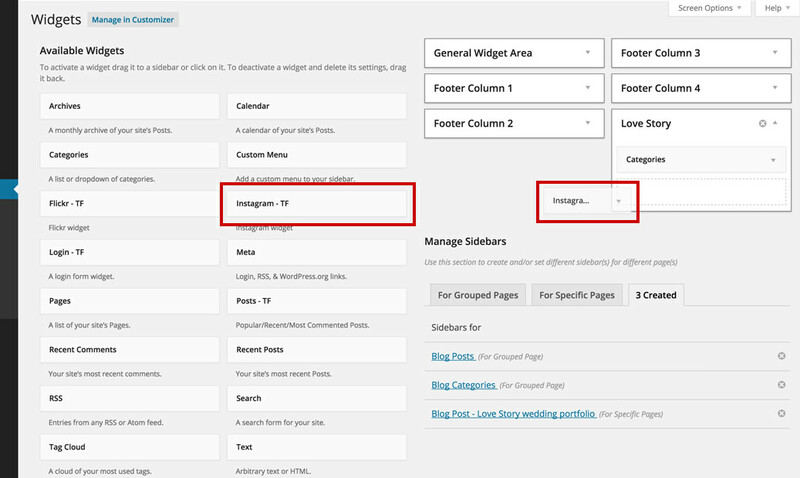 Pages are not associated with a date/time like Posts, nor can you tag or categorize a page. 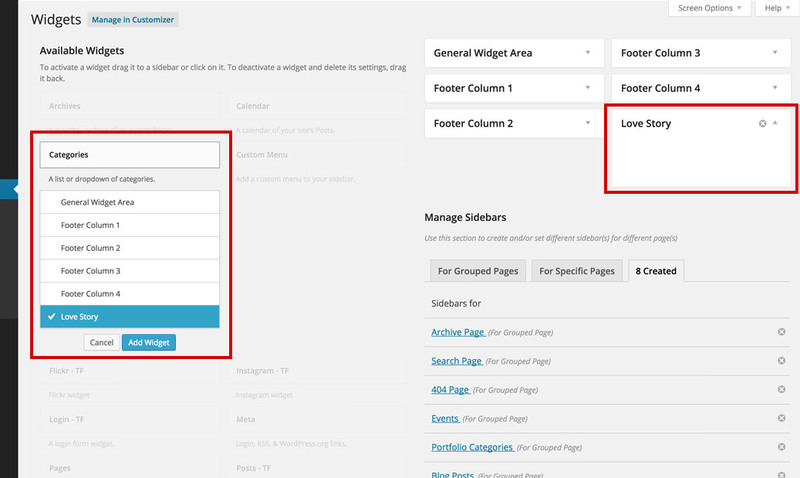 You can use Pages to organize and manage any content. In addition to the frequently used "About us" and "Contact us" pages, you can add other examples of common pages including "Copyright", "Disclosure", "Legal Information", "Reprint Permissions", "Company Information", and "Accessibility Statement". Regular template with sidebars (Appearance›Widgets). 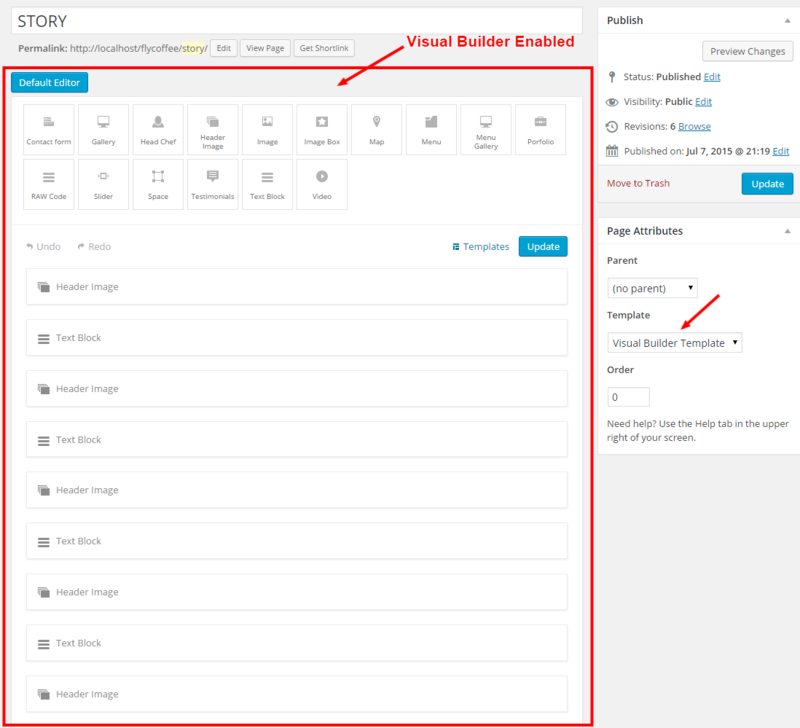 Full Width Page Template for theme visual builder. 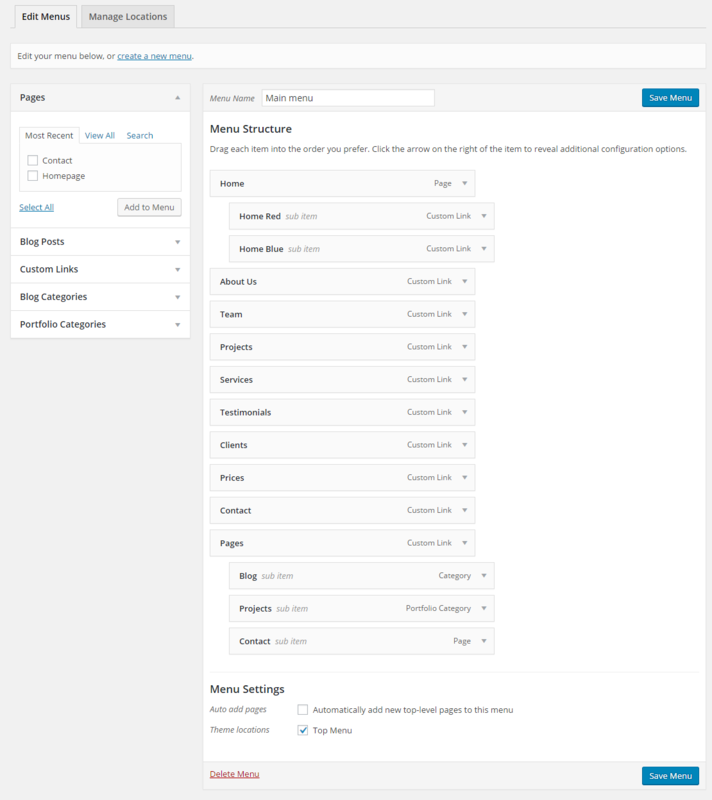 The seo settings after page content can be edited in Unyson page , Seo Extension, its compatible with this theme but not required. Portfolio post type is usually used to present your works and projects. Portfolio Posts consist of many elements. 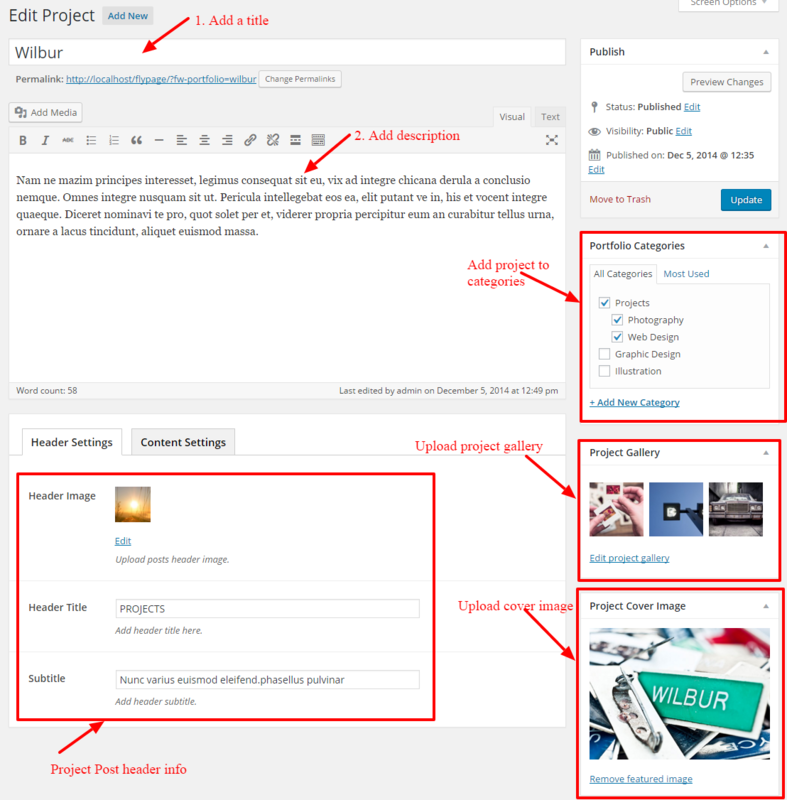 It has a gallery upload option which give you the possibility to upload many images for your project. Posts are entries on your Blog that are shown in a reverse chronological order on the front page of your Blog. 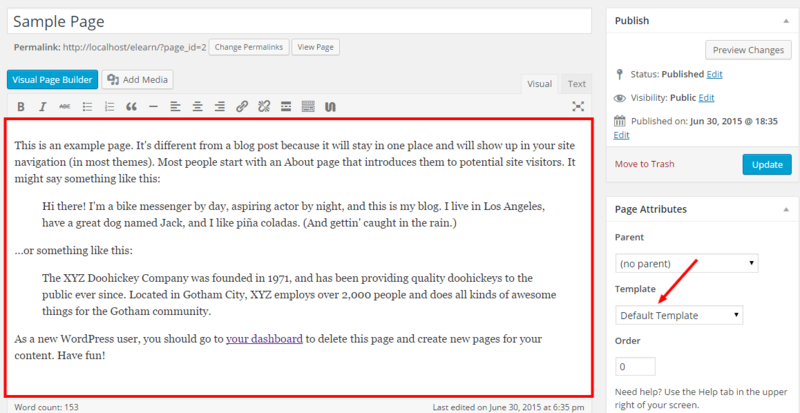 While using our theme, thanks to WordPress Posts, you can create a typical Blog or news about your company. If you do not know how to write a Post look for additional information on one of many websites which will help you with it, for example WordPress Codex. A shortcode is a WordPress-specific code that allows you to get an attractive elements with almost no effort. 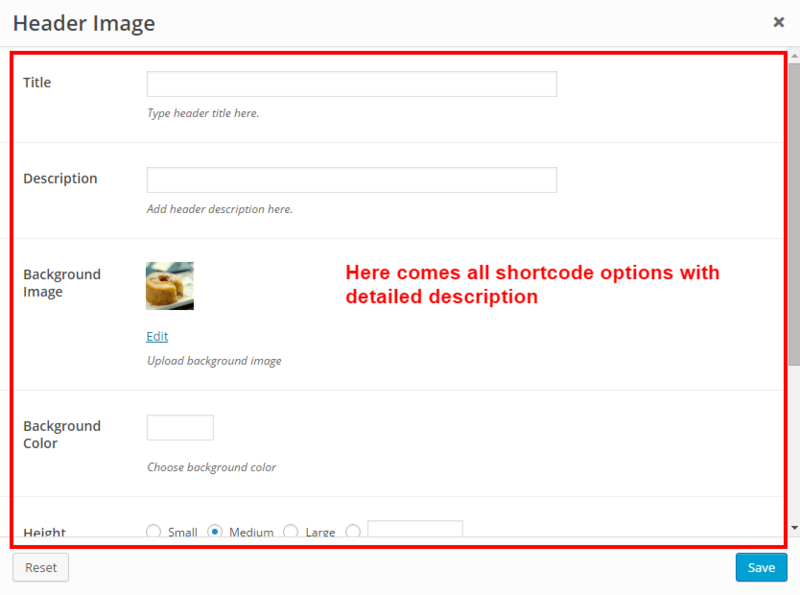 Shortcodes can embed files or create objects easily instead of using a complicated code. 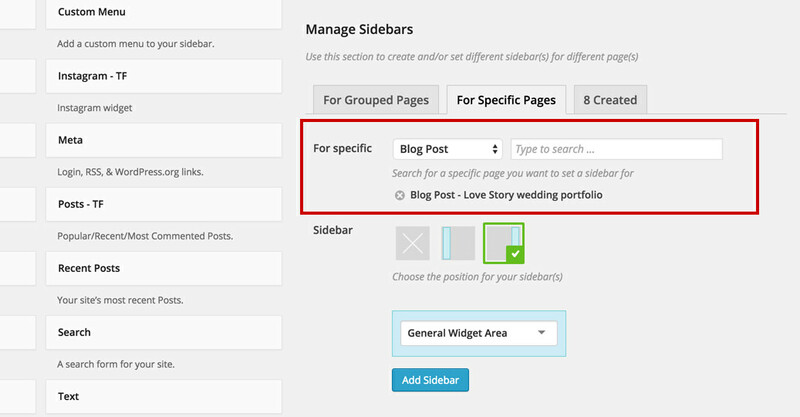 It is a specific content that you can add to the sidebars on your website. 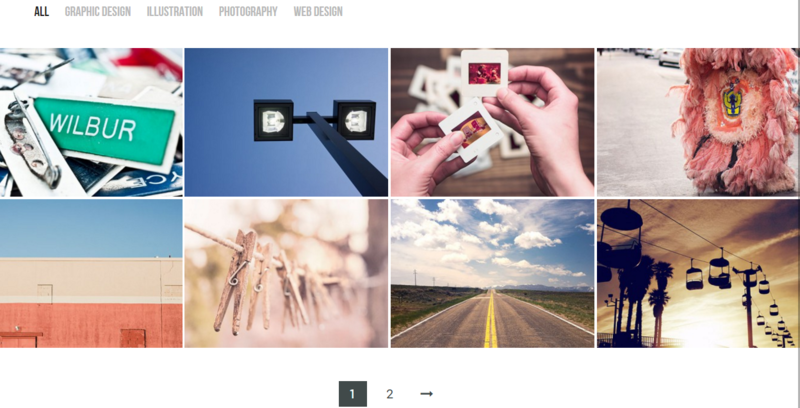 In our theme you can add widgets to the right, left sidebars and to the footer. They can be easily added, rearranged and removed by dragging it to the chosen place in Appearance›Widgets. 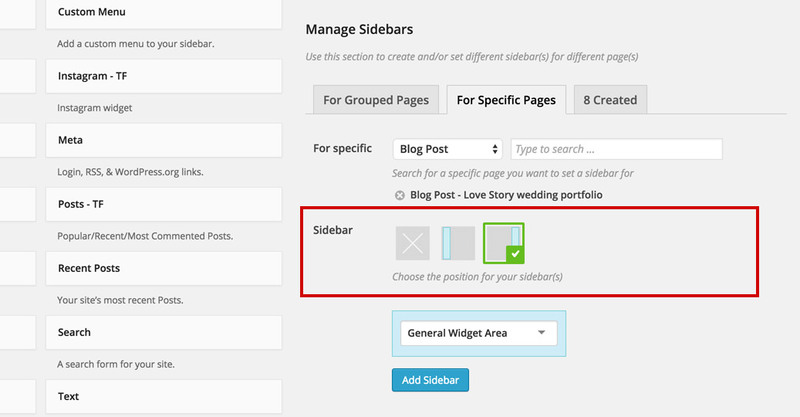 In our theme you can easily add as many sidebars as you want for any page. 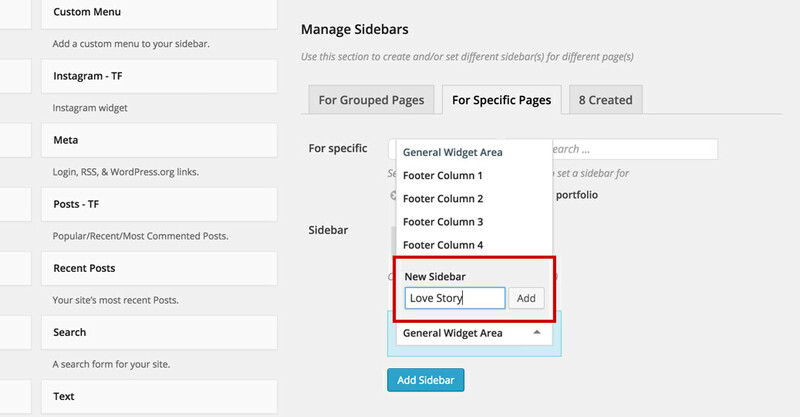 Add widgets in your newly created sidebar. Widget lets you display a images from Instagram in sidebar. 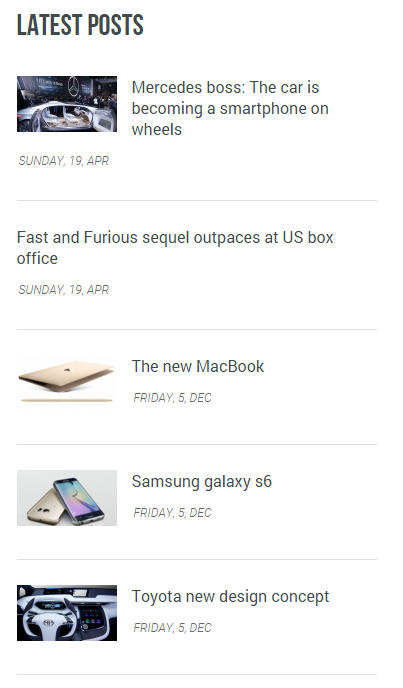 Widget lets you display your recent, popular and most commented posts. Widget lets you login from frontend. 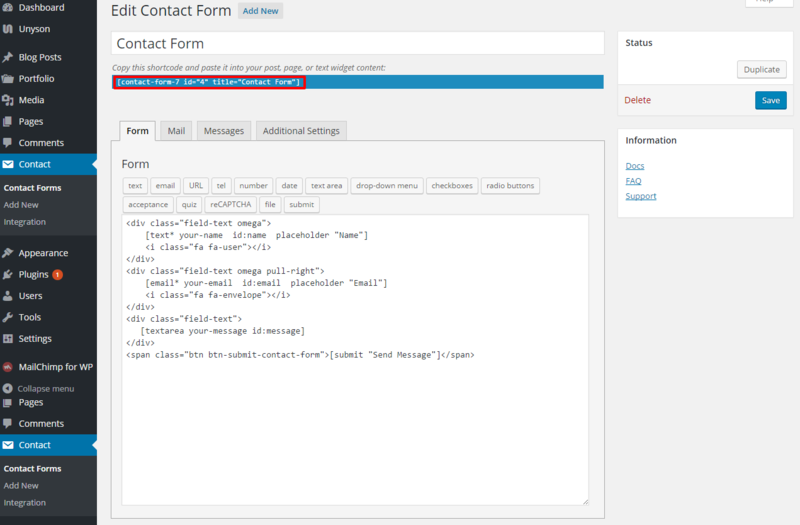 Flypage use Contact Form Extension from Unyson. Don't forget to rate our work on ThemeForest. 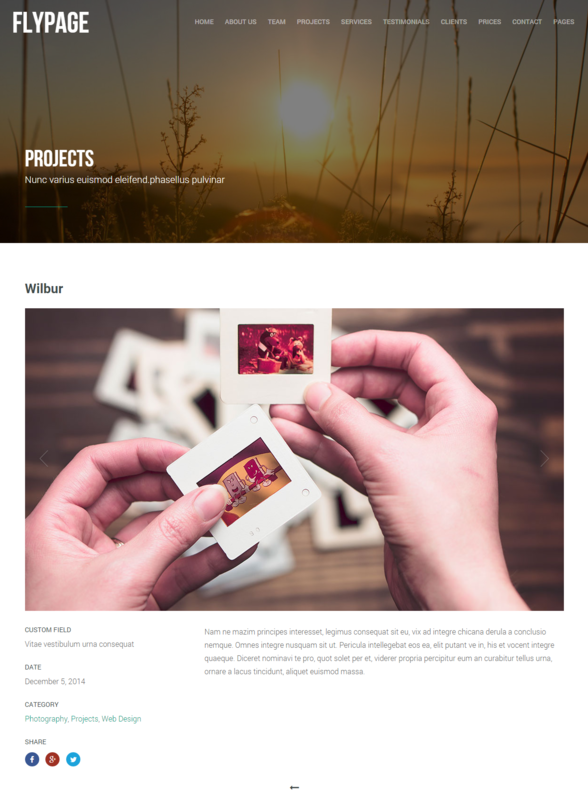 Flypage code and images licensed under ThemeForest.